On Sunday April 7th, the Park Sunday School children read John 12:1-8, in which Jesus receives anointing with expensive perfume, from a loving, woman disciple. We talked about the people we love, and how that love inspires us to want to give them generous gifts, as well as expressing our affection in other ways. We also put this into the Christian context, by discussing the fact that Jesus praised the woman for her outpouring of love; showing us that this sort of expression is blessed by God, and part of what we, as followers of Jesus, are called to do. 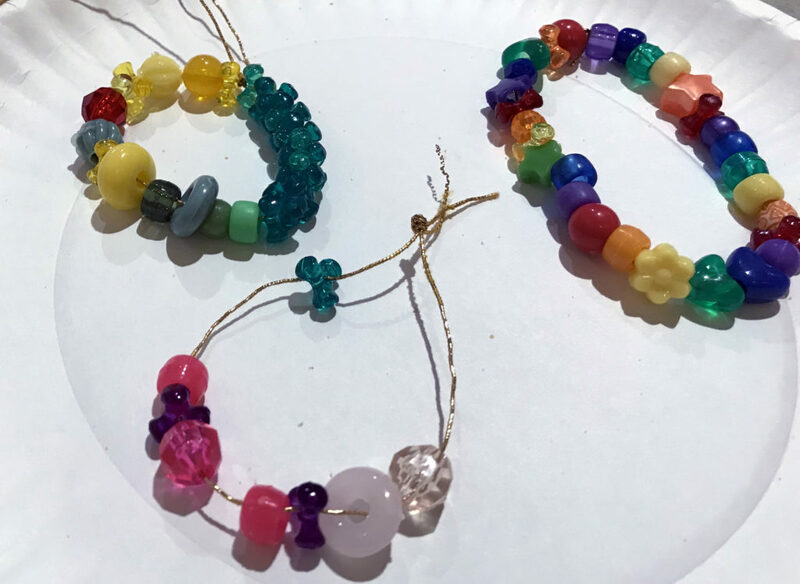 For their creative response activity, the children made gifts of Jewelry, with multi-colored, shiny beads, strung on golden cord, to share with their loved-ones. Next Sunday, April 14th, is Palm Sunday, and the children will be in the sanctuary, experiencing the service, along with me and their Sunday school teachers, Ms. Glenda and Ms. Laura. One of our children participated in the pre-recorded scripture readings that we will be hearing on Palm Sunday, with accompanying videos. The children will also participate actively in the service, by helping with the distribution of palms. For those times when they are not actually participating in the service, the children will have Holy Week/Easter themed coloring and activity books to enjoy. (Note to parents; if your children prefer to sit with you, rather than in the reserved Sunday school section at the rear of the sanctuary, that is also fine. On these special holy days, it’s all about what makes the service most joyful and meaningful for your family).